English philosopher and jurist; one of the chief expounders of Utilitarianism; author of Introduction to the Principles of Morals and Legislation. 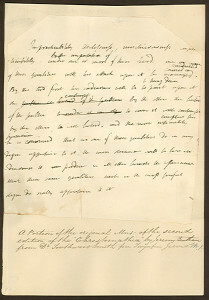 Autograph Manuscript, unsigned, full page, small quarto, undated. Fine condition. 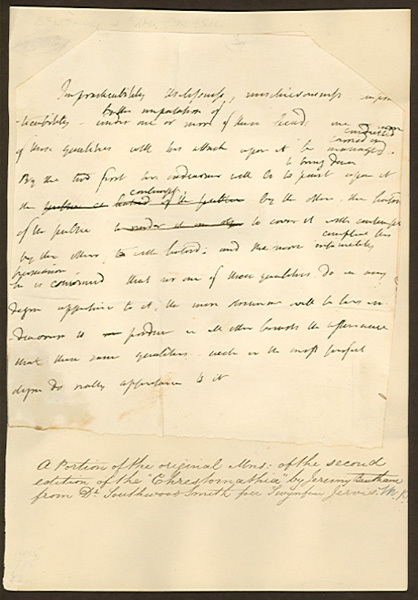 A portion of the original manuscript of the second edition of Chrestomathia, with corrections and additions in the text by Bentham. “Impracticability, uselessness, mischievousness…under one or more of these bends one of these qualities with his attack upon it…. By the two first he endeavours…to bring down upon it…contempt by…hatred, and the more…he is convinced that no one of these qualities do in any degree appertain to it, the more…will be his endeavours to produce in all other…the assurance that these same qualities…do really appertain to it.” Chrestomathia was a collection of papers in which the principles of the Bell and Lancastrian systems of education were applied to the higher branches of learning. The most novel features of this work were the prominence it gave to the study of science and its daring attack on Greek and Latin, which at the time reigned supreme in the process of education.